With a diameter of 13 millimetres, this example of our 18×7 stainless steel rope is reliably rugged and ready to tackle a number of different tasks across lots of industries. You can order the 13mm 18×7 Stainless Steel Wire Rope in a set length, or let us built a bespoke assembly featuring it. A wire rope of this diameter will clearly be quite strong. 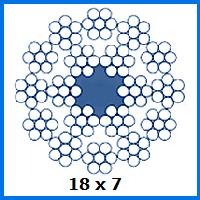 In the case of the 18×7 strand setup, you get a WLL of 8,871kg in unison with an 87kN breaking force. In comparison our 1×19 stainless steel rope of a similar width will be stronger. What makes this product more impactful is its abrasion resistance, lessening the impact of wear and tear when used in specific contexts. From marine rigging to sewage control cabling, an 18×7 rope could be the technically toughest, least likely to corrode products. Since we can construct unique wire rope creations using this 18×7 example or any other option on our site, you can control the precise form that your order takes. Our experts can add ferrules and other fittings at our modern factory, then ship the complete rope to your premises so that it can be used straight away. We can even build balustrades and save you even more effort. Let us know what you need by using our enquiry form or giving us a call on 01384 78004. However you prefer to get in touch, you can request more details about our products or get a quote before you make a decision. 13mm 18x7 Stainless Steel Wire Rope Overall rating: 5 out of 5 based on 6 reviews.